Accessible to visiting birders and residents alike, the Kent Valley is always an exciting place to bird. Although much of the valley is steadily being developed, there remains a healthy population of birds dependent upon the fertile, open areas near the Green River. One of the best locations to visit is the Kent Ponds (officially titled the Green River Natural Resources Area), a 300-acre site consisting of grassy meadows, cottonwood forests, and several freshwater impoundments. Originally used for wastewater treatment purposes, the ponds were abandoned in the 1970s. 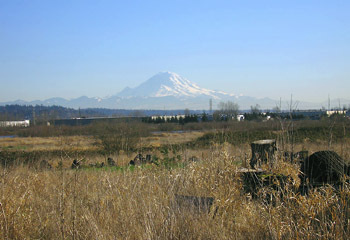 In 1996, the city of Kent initiated a project to enhance the area for flood control and wildlife. Viewing platforms and nature trails were set up on the west side of the property. Over 190 species have been recorded on the site. The ponds host a great diversity of waterfowl, some of which have been known to breed here on occasion (including such oddities as Canvasback and American Wigeon). Depending on the water levels, shorebirds can put on a good show (especially in August and September). From October to April, Peregrines and many other raptors are reliable at the ponds. Lazuli Buntings have nested on the site in recent years. Once in awhile, stunning rarities have shown up, such as the Rustic Bunting that appeared two winters in the late 1980s, and a Baikal Teal that caused a stir during winter 2004-2005. From I-5, take Exit #152 (Orillia Road) east from the freeway. Continue several miles until Orillia turns into 212th Street down in the valley. To visit the west side of the property, turn right (south) on Russell Road along the Green River. There are several parking lots on the left side of the road that give you access to the viewing platforms. To bird the east or south side, continue on 212th to 64th Avenue. Continue past the animal shelter, park in the lot near Web Press. Walk the short trail to the grassy hill - a good spot to view the wetlands - or walk to the south along the power-lines at the southern border of the property. Access to the west meadow is possible 9:30AM-4:00PM, Tuesday through Sunday in winter and spring; 9:30AM to dusk in summer and fall. Birding from the power-line trail or from the grassy hill is possible anytime. There are restrooms at Van Doren Landing Park across Russell Road from the ponds. UPDATE (May 2012): a recent visitor to Kent Ponds noted substantial changes to how visitors access the park. Russell Road is closed southbound. Access gained only from the South, going Northbound on Russell Road. All parking lots were locked on Saturday. Trails beyond the south viewing tower were marked as closed.